Boeuf Bourguignon. Bouillabaisse. Cassoulet. French food can sound a bit fancy-schmancy and things like frog legs and escargot can definitely be intimidating. But don’t let that keep you from enjoying a great French meal while you’re in Las Vegas. While you might find some very foreign-sounding things on the menus you’ll also find some more familiar things like mouthwatering steaks and roasted chicken. French food is considered some of the finest in the world and Las Vegas is home to restaurants from some of the best French chefs in the world. So go ahead and give one of these restaurants a try. Here are 10 of our favorite French places in Las Vegas. Bon appétit! Bouchon, photo courtesy of The Venetian. Bouchon at Venetian: Bouchon, from world renowned chef Thomas Keller, serves French bistro classics. The restaurant has an elegant main dining room reminiscent of something you’d see in Paris and a lovely patio outside. At breakfast you’ll find pastries like croissants and pain au chocolat. Other menu items include egg dishes, quiche and gaufres au Levain – that’s basically French for delicious waffles. They’re topped with fresh berries, maple syrup and Tahitian vanilla bean butter. At dinner you can select items from a raw seafood bar like oysters, mussels and clams. You’ll also find classic French fare like cheese plates, steak frites, roasted chicken, leg of lamb and boudin blanc – a white sausage with potato purée and dried French plums. Our tip: Stop at the Bouchon bakery on your way out and stock up on some more of those pastries. Joël Robuchon at MGM Grand. Joël Robuchon at MGM Grand: This restaurant is a Michelin Three Star establishment and it has won the AAA Five Diamond award among other accolades. The chef, Joël Robuchon, has been named France’s Chef of the Century by the esteemed Gault Millau restaurant guide. If you need any more convincing to dine here, this is Robuchon’s only restaurant in the United States so you know it’s special. Guests can indulge in a tasting menu or choose from several prix fixe menus. The dishes change seasonally but you might find things like truffled langoustine ravioli, farm chicken and foie gras, and caramelized black cod. Save room between courses for selections from the cheese trolley and bread cart and definitely indulge in the mignardises cart at the end of your meal. It’s loaded with heavenly sweets. Mon Ami Gabi at Paris Las Vegas. Mon Ami Gabi at Paris Las Vegas: Walk into Mon Ami Gabi and you’ll feel like you’re in a real French bistro. The restaurant has a dark, romantic dining room, a bright, sunny atrium and an outdoor patio that could be mistaken for a sidewalk café in Paris. The patio is definitely the place you want to be. You’ll be sitting under the shadow of the hotel’s faux Eiffel Tower, gazing at the Bellagio Fountains across the street and taking part in some of the best people-watching on the Strip. 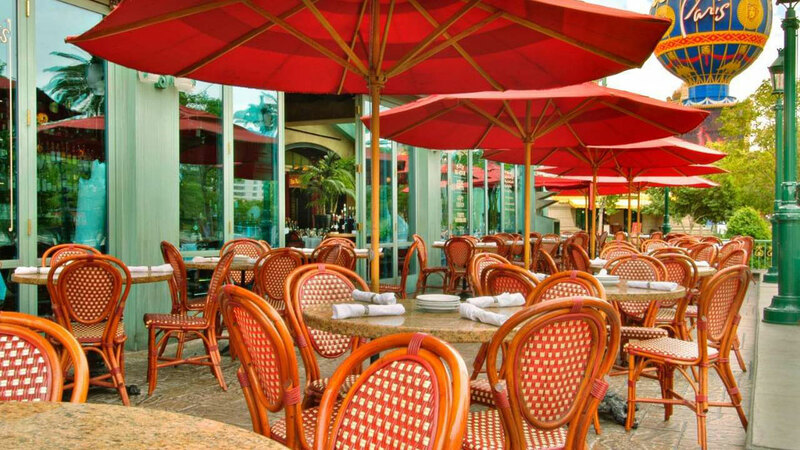 We love brunch at Mon Ami Gabi where you can nosh on French pastries, waffles, crepes, quiche Lorraine and more. Build your own bloody Mary or sip on some “Frangria,” which is French-style sangria with iced Beaujolais, Grand Marnier, fruit and rosemary. If you’re having lunch or dinner be sure to try appetizers like the baked goat cheese served with warm herb garlic bread or the onion soup au gratin. Mon Ami Gabi serves a variety of steak frites with a choice of toppings including merlot butter, red wine sauce, blue cheese sauce and brandy peppercorn sauce. André’s at Monte Carlo: Chef André Rochat is a pioneer in the Las Vegas dining industry. In 1980 he introduced the city to its first freestanding fine dining experience when he purchased a 1930s-era house downtown and transformed it into his eponymous restaurant. In 1997, Rochat expanded with a second location, André’s Restaurant and Lounge at Monte Carlo. André’s has been recognized by the Michelin Guide with the one-star rating. Guests can choose from à la carte or tasting menus and dine on dishes like pork rillettes, French onion soup, foie gras terrine, frog legs, Maine lobster thermidor, pan seared duck breast, roasted chicken breast and André’s famous Dover sole. It’s flown in fresh from France every week. It doesn’t get any more authentic than that. 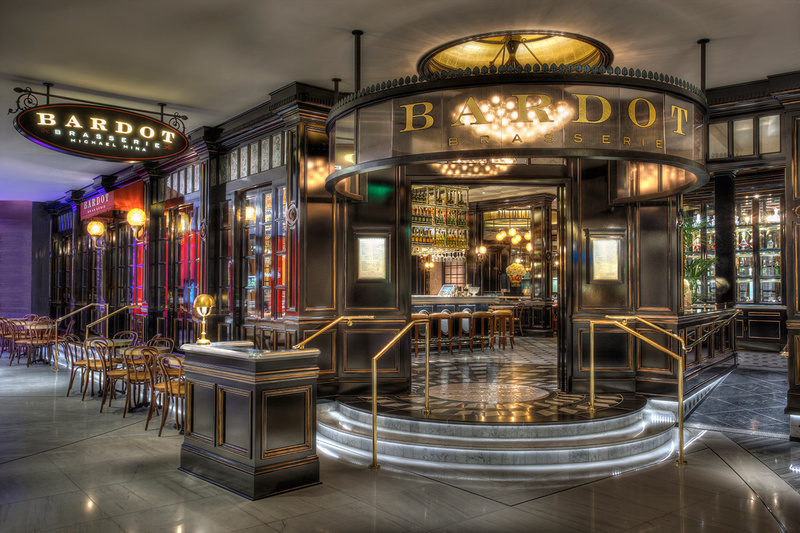 Bardot Brasserie, photo courtesy of Michael Mina. Bardot Brasserie at Aria: Walking into Michael Mina’s Bardot Brasserie feels like walking into a Parisian café. But it’s the food that will really make you feel like you’re in the City of Light. Mina has taken traditional French brasserie favorites and put his twist on them. The result is some of the most authentic and tasty Parisian food in Las Vegas. It’s definitely worth ordering a few hors d’oeuvres to start. Fans of escargot will be blown away by Bardot’s version. Each escargot is individually wrapped in a delicate puff pastry. Other options include a creamy foie gras parfait with a ruby port gelée on top and hearth-fired bone marrow. It can be tough to choose between entrees, but we have a few suggestions. The Parisian gnocchi is perfectly prepared and served with wild mushrooms, goat cheese and roasted garlic. The sautéed skate wing (a mild white fish) is served with a wood-roasted cauliflower purée, caper brown butter and lemon with a side of kale that would make any kale haters change their minds. The French know how to do dessert so be sure to try the giant chocolate macaron at the end of your meal. You can thank us later. Restaurant Guy Savoy at Caesars Palace. Restaurant Guy Savoy at Caesars Palace: If you’re looking for fine French cuisine, it doesn’t get much finer than this. Guy Savoy is a Michelin two-star restaurant with a menu that emulates the chef’s Paris restaurant. The menu in Las Vegas features many of the chef’s classic dishes including his famous artichoke and black truffle soup and toasted mushroom brioche with black truffle butter. Other items include caviar, lobster, sea bass and veal. If you really want to get extravagant, dine at the Krug Chef’s Table in the United States. It’s a six-seat table with a view of the kitchen. Guests enjoy a tasting menu paired with Krug’s prestige cuveé Champagnes. Le Cirque at Bellagio: Le Cirque has been a AAA Five Diamond rated restaurant for 13 years. That should tell you a little something about how good it is. 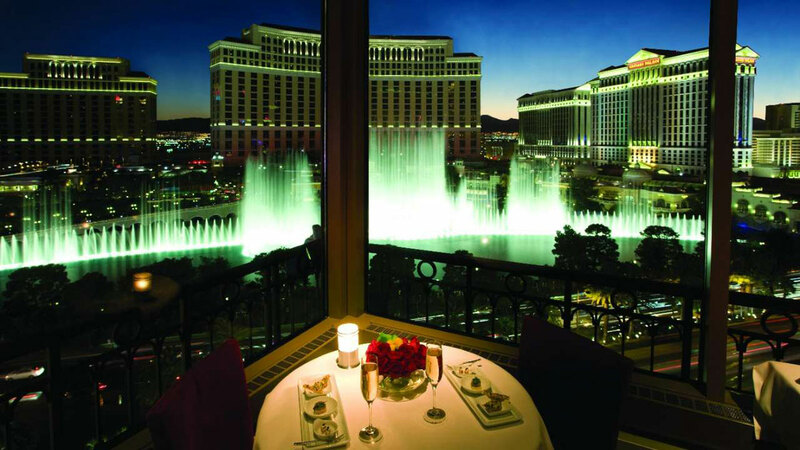 The restaurant, from restaurateur Sirio Maccioni, overlooks the Bellagio Fountains and serves classic French cuisine. Start with Burgundy snails in black garlic herb butter, move on to roasted chicken with black truffles and finish your meal with a soufflé or crème brulee. Twist by Pierre Gagnaire, photo courtesy Mandarin Oriental. 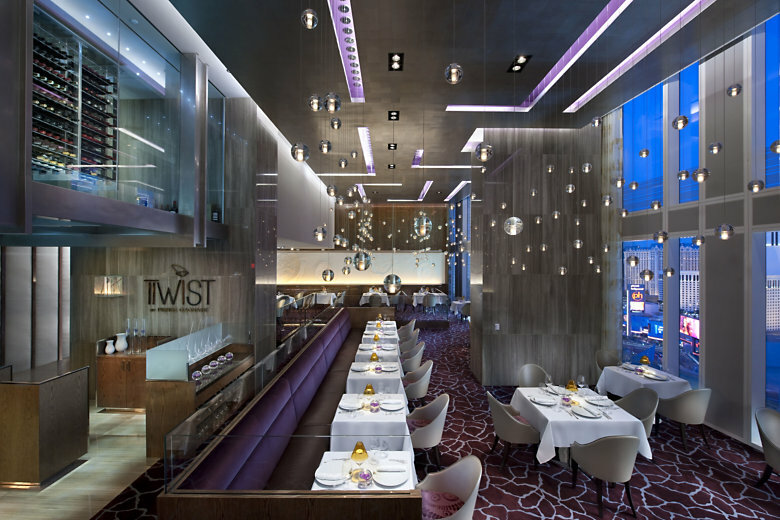 Twist at Mandarin Oriental: Twist is the only place in the United States where you can taste the cuisine of acclaimed chef Pierre Gagnaire. The restaurant, located on the 23rd floor of Mandarin Oriental, is a Forbes Five Star award winner and serves classic French cuisine with a contemporary edge. Open only for dinner, Twist offers guests the choice of seasonal à la carte dishes, a three-course tasting menu or a lavish six-course dining experience. While the menu changes seasonally, dishes might include grilled French turbot fillet, foie gras, langoustine and venison. For desserts there’s apple tart tatin and mille-feuille, a delicate puff pastry. Eiffel Tower Restaurant at Paris Las Vegas. Eiffel Tower Restaurant at Paris Las Vegas: What could be more French than dining inside a replica of the Eiffel Tower? The views are spectacular from the floor-to-ceiling windows in this eatery 100 feet above the Strip. This is where you want to go for a date night or special occasion. Chef J. Joho serves French classics like crêpes, foie gras torchon, Muscavoy duck breast, roasted rack of lamb and a charred spice crusted venison. Guests can choose from a tasting menu or an à la carte option. 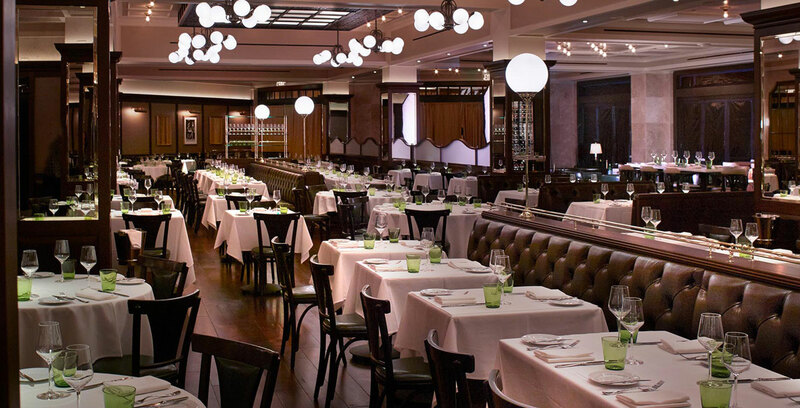 db Brasserie, photo courtesy The Venetian. db Brasserie at Venetian: Acclaimed chef Daniel Boulud serves contemporary French fare with some American touches at his brasserie at The Venetian. Classic French dishes include foie gras terrine, mushroom velouté, French onion soup, salmon rillettes, escargot and country pâté Bourguignon. Entrées include steak frites, seared sea scallops, crispy duck confit and coq au vin. If that’s all a little too much for you, don’t worry, Boulud’s signature burgers are also on the menu. But at least get one with a French touch. We love The Frenchie – a beef patty, morbier cheese, Dijon mustard, pork belly tomato-onion compote, arugula, black pepper bun and fries.